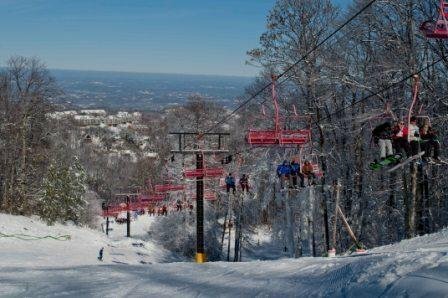 Ober Gatlinburg Ski Resort and Amusement Park may be known for their Aerial Tram, but they area also home to great Southeastern Skiing. The Resort offers 9 trails for skiing and snowboarding that are serviced by two quads, one double and one surface lift. The Tennessee resort has 100% snowmaking and offers a great equipment rental program. Ober Gatlinburg's Restaurant and Lounge provides a great meal under cathedral ceilings and in front of a large wood stove. Smoky Mtn. Snow Sport School, rentals, retail ski shop, snack bars, food carts, cafe, and lounge. First aid operated by National Ski Patrol.